Following Jerónimo Hagerman’s Malas madres / Lives hanging by a string comes the second in a series of artistic interventions set to occupy different spaces in Tabakalera. 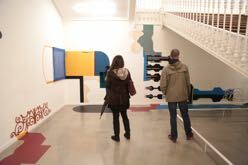 Miren Doiz has drawn on the space itself to create this intervention inside the Tabakalera building, extracting from it the shapes and materials for developing her project. Her seven chosen shapes have been taken from different architectural elements. Some of them are highly characteristic of the old building, such as the wrought iron entrance or the bannister balls. Others, including the hexagons of the glass roof, or a shape lifted from the ventilation tubes in the office kitchen, are derived from the new space. 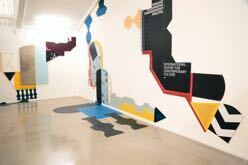 Thus, Doiz combines forms from both public spaces and areas accessed only by people working in the building. These shapes will be recreated using different materials, much of it recycled from Tabakalera, including plexiglass, reclaimed wood, old signage, and old features such as doors, giving in a continuous nod to the space as both a container and something which is contained. The intervention will be defined by its manipulation of scale and by its relationship with the building’s architectural elements and the public, as well as for the artist’s use of different materials, the role of colour and the intervention's reach within the space.